When fine arts majors prepare to graduate, they must go beyond the classroom and put together an exhibition as their final farewell to USD. This week, five seniors are showcasing their work in their Blacksheep exhibition. The Blacksheep exhibition opened Monday and will be open all week, with the closing reception on Friday night from 6-8 p.m. in the John A. Day Gallery in the Warren M. Lee Center for Fine Arts. Emma Johnson, senior fine arts major with an emphasis in printmaking, said the exhibit is a good opportunity to prepare for life after graduation. Putting together a gallery gives students an opportunity to make connections and learn how to pick the featured pieces. Andrew Cooper, senior fine arts major with an emphasis in graphic design, said working on the gallery has given him experience in promoting his ideas. Putting together an exhibit is a graduation requirement and seniors are randomly placed in groups of five for their final exhibit. The exhibits are held all throughout the semester. The name “Blacksheep” was decided after the group met and talked about potential promotions for the exhibit. Johnson said having a theme for student showcases is rare because the groups are randomly selected, and the art doesn’t necessarily follow a theme. 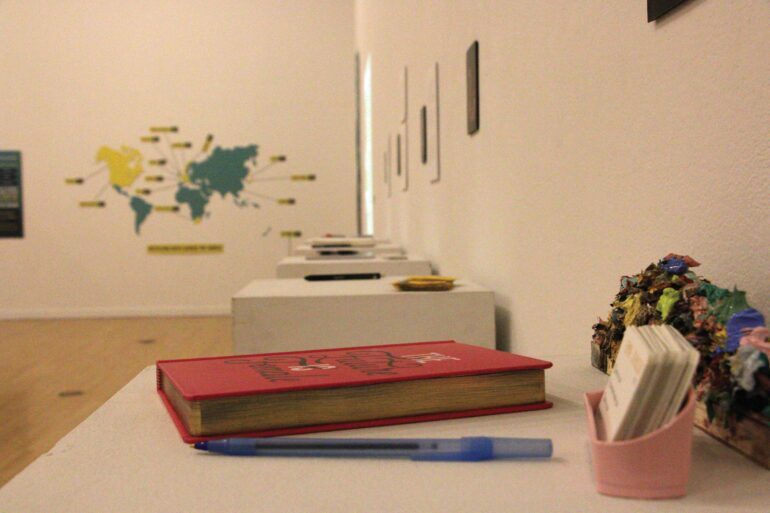 The Blacksheep exhibit showcases various forms of artwork on all kinds of media. Artists were able to select whatever pieces they wanted for the show, even if they do not correlate with their major. Johnson said it was hard for her to decide what pieces she wanted to showcase, and ultimately decided to display a series of four paintings as well as a yarn display. Each artist has different hopes of what people get out of the exhibit. Johnson said she hopes people can take away her message on the lack of education women are offered about their bodies. Cooper said he hopes viewers will leave the exhibit with more knowledge on different mediums of art. Carly Ribstein, senior fine arts major with an emphasis in graphic design, said the wide variety of pieces is what makes Blacksheep a unique exhibit.